We’d love your help. Let us know what’s wrong with this preview of A Discipline of Programming by Edsger W. Dijkstra. To ask other readers questions about A Discipline of Programming, please sign up. how to get his book in india ? its too costly!! "For lack of a bibliography, I offer neither explanation nor apology." This book delivers what I had expected to get from Stepanov and McJones's Elements of Programming (Elements of Programming is great; it's just a different book than I thought it would be). Dijkstra is a programming legend. Aside from "Goto statement considered harmful" he made a mark in just about every field of programming: from Dijkstra's shortest paths to Dijkstra's banker's algorithm to semaphores to coloring garbage collectors to several others. The opportunity to learn from him really shoul This book delivers what I had expected to get from Stepanov and McJones's Elements of Programming (Elements of Programming is great; it's just a different book than I thought it would be). Dijkstra is a programming legend. Aside from "Goto statement considered harmful" he made a mark in just about every field of programming: from Dijkstra's shortest paths to Dijkstra's banker's algorithm to semaphores to coloring garbage collectors to several others. The opportunity to learn from him really shouldn't be passed up. The most important book any young programmer could find. It changed my life. very nice book. It gives you new insights on how to program, what is programming, and what is a program. Dijkstra's ideas about programming, were, and still are, very different from the "conventional wisdom". Even if you don't agree with him, i think it's worth checking out. wish there wa very nice book. It gives you new insights on how to program, what is programming, and what is a program. Dijkstra's ideas about programming, were, and still are, very different from the "conventional wisdom". Even if you don't agree with him, i think it's worth checking out. wish there was someone i could read this book with (end of sad remark). This short book is one of the finest ever written on the subject of programming. Dijkstra's examples are deceptively simple; his solutions are beautiful and elegant. 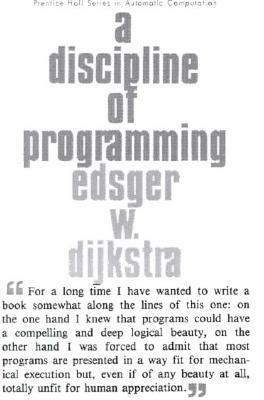 Every programmer should read this: Dijkstra was our progenitor: everything he wrote was relevant and always will be. 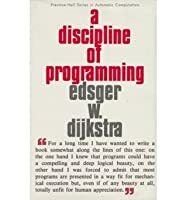 Dijkstra once stated, "If a programmer can look at his code and say, 'Dijkstra would not have liked that,' then that is immortality enough for me." This book shows us why. By the time I finished the first chapter I was certain I knew nothing about programming. it's difficult for me to go on..
this is one of those books that i intended to read for years, and gave up each time after read through a dozen page or so. this time, i pushed through pattern matching chapter now.beautifully written, lots of insights and wonderful.illustration of problem solving. the main theme is closely related to udi manber algorithn book. It is hard read, enjoy seeing the design and problem solving process. Edsger Wybe Dijkstra was a computer scientist. He received the 1972 Turing Award for fundamental contributions to developing programming languages, and was the Schlumberger Centennial Chair of Computer Sciences at The University of Texas at Austin from 1984 until 2000. Shortly before his death in 2002, he received the ACM PODC Influential Paper Award in distributed computing for his work on self-st Edsger Wybe Dijkstra was a computer scientist. He received the 1972 Turing Award for fundamental contributions to developing programming languages, and was the Schlumberger Centennial Chair of Computer Sciences at The University of Texas at Austin from 1984 until 2000. Shortly before his death in 2002, he received the ACM PODC Influential Paper Award in distributed computing for his work on self-stabilization of program computation. This annual award was renamed the Dijkstra Prize the following year, in his honor.